﻿ Grenadines islands from Saint Vincent and Mustique to Carriacou. Grenadines islands from Saint Vincent and Mustique to Carriacou. Caribbean islands in BWI, the British West-Indies. Saint Vincent and Grenada with the Grenadines island chain from Carriacou to Union and the Tobago Cays. Guides » The Grenadines islands – From St. Vincent down to Carriacou. The Grenadines islands – From St. Vincent down to Carriacou. 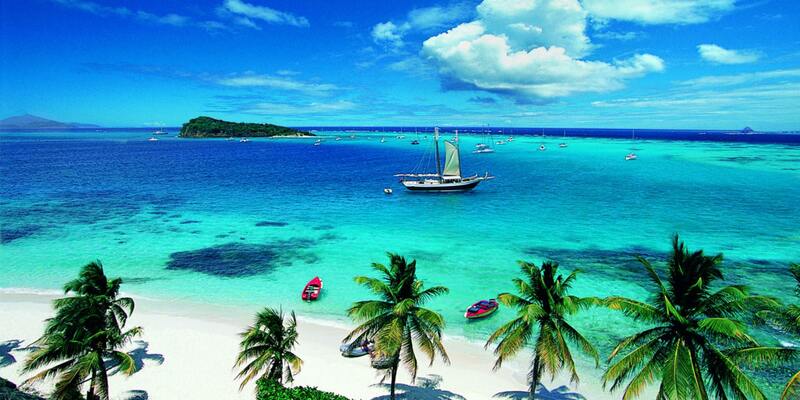 A paradise for sailors in the Caribbean. You should without any doubt visit the Tobago Cays. Find the Cays beside Union Island, and more or less in the middle of the Grenadines. First of all, this is a picture perfect place to relax on your boat. For the sailing here it is a great experience with all islands at a short distance. As a result you can go island hopping all along the Caribbean. From the hurricane safe harbours of Trinidad in the south, all the way up to the Bahamas and further. Most noteworthy, this is where they made Pirates of the Caribbean. Discover these shallow reefs which are ideal for snorkling. These Cays are a nature reserve where you are not allowed to fish. Hence there is an enourmous variety of marine life here in the Tobago Cays. Swim with the turtles, you will probably not find any better snorkling elsewhere. Wikipedia article about these islands. In total there are 32 islands and cays that make up St. Vincent and the Grenadines (SVG). Only nine of these 32 islands are inhabited, that is including the mainland of St. Vincent. Islands in a chain, Saint Vincent in the north and the following islands. Bequia and Mustique, Young Island, Canouan, Union Island, Mayreau, Petit St Vincent Carriacou and Palm Island. Previous: New topic for the Carriacou forum. Next: Dumfries Historical site and ruins.